Witness an aerial view of the city; try the popular hot air balloon ride activity in Avanos. In this ride you get spectacular views of the nature kissed city and the beautiful valleys while you're in a sky full of colorful balloons. A much recommended try in the city of Avanos. There are various companies that host these rides. You can pick the one you like. Prices and timings will depend on your choice of ride and choice of company. Please enquire before your visit as opening hours is depend on Company. How popular is Balloon Rides? 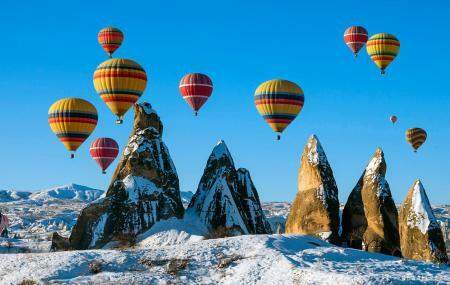 People normally club together Red Valley and Goreme Open - Air Museum while planning their visit to Balloon Rides. People also prefer to start their day with Balloon Rides.